There is just one mayapple. 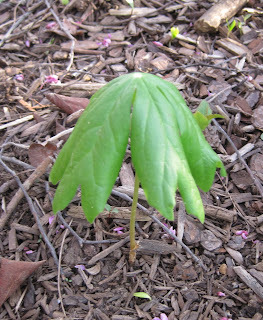 I should pull up this one mayapple like it is a weed. It might take over my woodland wildflower garden. I never planned to have mayapples in my woodland wildflower garden. It's a hitchhiker, a hobo, catching a ride with another wildflower that I saved from the woods-turned-into-a-lake. In the woods where the mayapples grow, you never see just one mayapple. You see a whole field of them. Can you have a field in a woods? 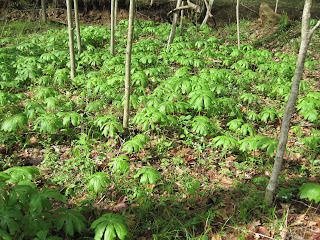 Maybe it is a grove of mayapples? 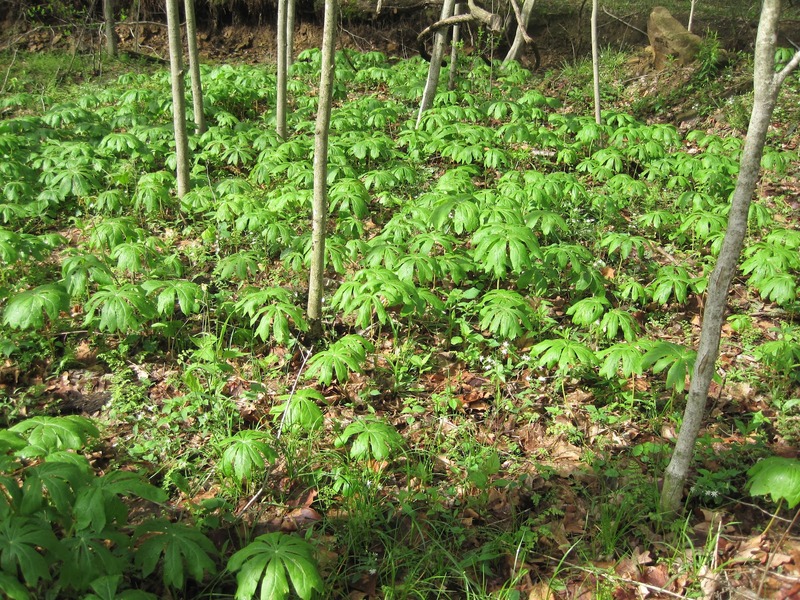 Field or grove, there is never just one mayapple plant, all alone. There is always a big colony of them. Yes, colony. A large grove, field, colony of mayapples. Is it likely to be happy in my garden? Probably not, or not for a long time. 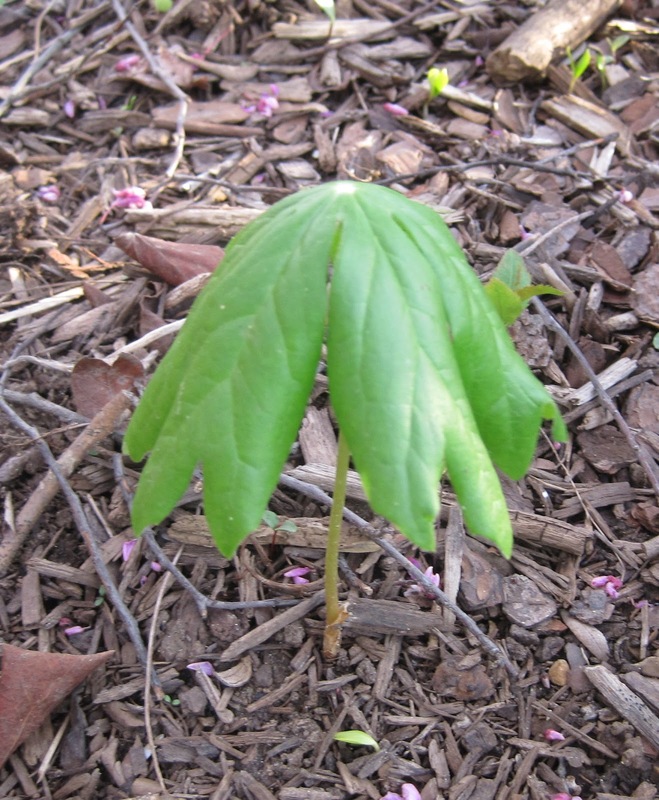 I think the lone mayapple may hang on for a while, but I don't think it will thrive in my garden. Not enough shade. Not enough good, rich forest soil and humus. What harm would there be in leaving it? What would it hurt to just let it be and see if next year there are two leaves, then four leaves? I've never heard of a gardener cursing the mayapples in their garden, expressing regrets for planting one mayapple or resorting to all sorts of evil deeds and evil thoughts to get rid of mayapples. I think I'll leave my one mayapple alone and see. One mayapple is better than none! I love this native plant. If this one did just show up maybe it likes your woodland garden after all. I think it will be happier than you think. No, I haven't heard of gardeners cursing mayapples either. I find them rather pretty. Silly Gardener, these are not "just" Mayapples, they are Fairy Umbrellas! Let the fairies decide how many are needed! You cannot have too many mayapples but you can have too few. Keep 'em growin'. They are slow colonizers, at least in my garden. They don't begrudge any other wildflower that wished to grow with them either. I don't think you will be disappointed if you leave this loner. They are so cheerful in the early spring. Popping up to see what the world will offer them. Then of course they offer the fairies some beautiful green umbrellas and a lovely little flowers they can see. I find it very interesting. I can see the ideas that you want to share. Thanks! Not only are they pretty and hardy but the females have fruit which you can harvest and make jam out of. But of course you will definitely need a grove, colony, field, whatever of them to make very much jam. I'm with Irwin. It will be happier than you think. I would not get rid of it, but I would move it away from anything slower growing. Spoken by someone who had to dig up a trillium to remove all the mayapple roots entwined around it. The mayapple was winning. I say leave it. You've seen the size of my garden, and I wouldn't want to be without mayapples. They are a delight of spring. That said, I do have to dig up copious amounts of them every year as they spread into the path. I have them segregated from less thuggish things by a dry creek and a path.